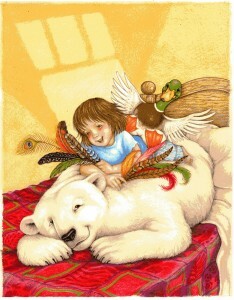 You are currently browsing the Laurie Klein Art — Laurie's Place blog archives for December, 2009. This story begins in the middle – with the shipping of the 13 color illustrations and cover art for my 4th children’s book for Sylvan Dell Publishing, “Fur and Feathers“, by Janet Halfmann (author of “Little Skink’s Tail“, our first collaboration). I just got word that all the drawings arrived at their destination safely so i can breathe a sigh of relief and now my job is largely done, at least until the book itself is printed and bound and i can start officially sharing it (at book signings and school talks and various conferences). I say we are in the middle of the story because the whole thing began earlier this year (around March/April 2009) and won’t come to it’s ultimate (hopefully successful) conclusion until nearly the end of the next one (Fall/Winter 2010). It’s really a lengthy process getting words and pictures into finished book form – and kind of a fascinating one, at least from my perspective – so i thought it might be interesting to chronicle the whole affair from beginning to end. Unlike my first two protracted blog entries, however, i shall attempt to keep the “Fur & Feathers” account a bit more concise. I love this ability to write and describe and share the creative thought process but i realize i do have a weakness for verbosity. I also know if i make the entries too long no one will read them (or they will doze off in the middle or worse, start skimming). I know i certainly tend to skip articles that look too long, and completely avoid recipes of too many ingredients and instructions. However, despite being aware of my long-winded tendencies i’m not going to promise brevity… only that i’ll try to keep these particular entries contained in smaller, easier to read, segments. So we shall call this first account (in the “Fur & Feathers Category”) the “F&F Intro”, even tho it takes place 10 months after the actual beginning of events. And to further the out-of-kilter continuity the attached cover illustration doesn’t technically enter the narrative until 5 months later, but i thought we needed a visual image to start the tale (and it does – eventually – become the approved cover design, so i’m giving a bit of a preview to up-coming events in the hopes of pricking your interest). Welcome to “The Fur & Feathers Journey”….. or…. I have been drawing my own Christmas cards since college. The first one began as an assignment but every Christmas after that i just liked having the creative outlet. The designs started out simply enough – variations on traditional holiday icons – but before long i began getting more adventurous. It wasn’t long before i started coming up with little stories to complement the picture, and added that to the back of the card. Over time however the stories started getting more complicated, or the illustrations did – becoming a kind of visual version of a Year in Review letter only with lots of hidden subtext. Thus requiring a full sheet of paper… and very small type. All this is by way of a Preface for my 2009 Christmas card and the story behind it. Now besides simply showing the work i can also share the behind-the-scenes details and inner workings of my convoluted thought process. So sit back, relax, maybe stock up on some food and beverages cos this might take awhile, and allow me to share the explanation that accompanied ~ “Auld Lang Syne In the Land of Let’s Pretend (with bagpipe and fanfare)“. It’s that time of year again ~ time for Laurie’s seasonal homage to current interests, obsessions, and the year’s events and activities, the Rorschach Test known as my annual Christmas card. While i really intended this one to be less complicated then usual those familiar with the process know even the most simple idea tends to have a convoluted story behind it and this year is no exception. So let the elucidation begin. The original idea was born in October at my alma mater, Maryville College. I had been invited to do a book signing for Homecoming and Oblivious Me didn’t realize it also happened to be my 30 year class reunion (i’m terrible with numbers so didn’t notice the date but friends suggested i was simply in denial) so Reunions and Reconnections became something of the underlying theme for the card. And it began with the Scottish Terrier. I should note here that i have long loved Scotland (we have relatives in Ayrshire, the Children’s Hospice Association Scotland has a few of my books, and this year i met a delightful couple from Edinburgh on the A Train from JFK) and while it has been a source of artistic inspiration oddly enough i had completely forgotten Maryville College had a strong Scottish connection (we were the Fighting Scots after all, with a Scotty dog mascot. We even have an official tartan). Once i was reminded of this past link i knew i had to celebrate it in this year’s card and figured the Scottish terrier was a natural place to start. Problem is, we do not own a Scottish terrier which i feared might cause some confusion (our dog heralds a bit farther south: Wales to be exact). But then i thought – why not include our new Welsh corgi, Taliesin (named for the famous Welsh bard, tho we call her Tali for short) since she has yet to be featured in a card, and this will be her second Christmas with us. And that was the card, tho obviously i couldn’t leave it at that. I wanted to include some of the year’s other hi-lights so that’s what prompted the addition of the standing stone. 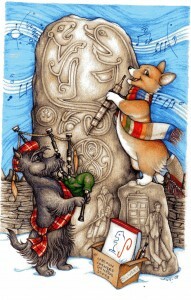 I’ve used them before [refer to the 2007 card ~ “Tasha & Taliesin, In the Company of King Arthur’s Bard”, which also happens to feature our first corgi], but what better way to include a whole bunch of disparate ideas (not to mention tie into the Celtic theme) then by carving them into a Pictish stone which, in this case, was specifically inspired by [another connection] a book on the Picts recently given to me by our Scottish relatives. Historically there is some debate about what the various stones, circles, and carvings might mean, but speaking as an artist who likes to tuck the occasional personal image into her work i can easily imagine a few ancient sculptors including their own obsessions and memorable events into their commissioned designs (i just use paper while they use rock). And this year was full of memorable events. For one thing, i now have this web site (new this year). For another, i painted a series of murals for two local elementary schools: J A Crookshank (represented by their mascot, the Cougar) and Ketterlinus (represented by their mascot, the Dolphin). The dolphin carving serves multiple purposes as it also represents a couple other projects – my first residential mural (an under-the-sea theme featuring three dolphins) and the 47 species of dolphins i drew for SeaWorld (36 Oceanic Dolphins, 5 Fresh Water/River Dolphins, and 6 Porpoises). As for the obsessions ~ interest in Doctor Who continued from last year [featured in last year’s scratchboard card ~ “The Ghost of Christmas Who…” ] particularly when my daughter, Jesse, got hooked on the show over the summer (my wonderful partner in crime). And since this will be our Doctor’s last year (sadly he regenerates into a new guy in 2010) i specifically wanted to include him and the TARDIS in this card. Other Doctor Who references include the Gallifrey Time Lord Seal of Rassilon and Tali is wearing the scarf favored by the 4th Doctor (who i first encountered back in college – note the returning connection). Also, the music wafting above the stone is not Auld Lang Syne, despite the title of this card, but is instead the final bars of the Doctor’s original, hand-written, symphony, “Ode to the Universe” (as seen in his Music of the Spheres concert appearance). Of course no card would be complete without Jesse’s and my original Mother/Daughter obsession – Star Wars, especially since we both saw “Star Wars In Concert” (albeit separately and in different states), thus combining both music AND obsession. To that end (and to mirror the Doctor Who images) i included Obi-Wan Kenobi and the Rebel Alliance insignia on the stone. And to further the musical emphasis Tali holds a Fanfar, the wind instrument played by Tedn D’hai of the band, the Modal Nodes (aka: The Mos Eisley Cantina Band). Which brings us to the most memorable event of all, represented by the box at the base of Tali’s stone. As mentioned in my bio on the Contact page, when i was a little girl in Philadelphia one of my favorite TV shows was Cartoon Corners General Store, hosted by Gene London. Mr. London told stories and illustrated them on big pads of white paper and i have long credited his show, and his drawing, as inspiring me to be an illustrator. I mentioned this in an Internet interview earlier in the year and a short time later received an e-mail from my publisher, forwarding a letter they had received on behalf of London Studios. GENE LONDON himself wanted to contact me! Words cannot express my thrill, but perhaps the picture can. My parents once took me to a taping of Cartoon Corners and as one of the kids in the “peanut gallery” i got to draw a design on Mr. London’s drawing pad which he then turned into a picture. Sadly i no longer have the sketch he drew but i do have the memory of a squirrel that he made out of my squiggle. And one last note before i bring this tale to an end. Often i spend as much time coming up with the titles of my cards as i do drawing them but “Auld Lang Syne” seemed an obvious choice for an illustration of a Scottish terrier playing a bagpipe inspired by a college reunion (“Ode to the Universe” aside). Of course, much like the card itself, it would have been far too easy to end there. Then i remembered seeing the lyrics to the song Mr. London sang just before he’d tell a story, the final line of which was, “In the land of Let’s Pretend”. Brilliant! So with that, the links and connections, the reunions and the remembrances, the music and magic are complete. To old acquaintances & cherished friends, Time Lords & Jedi Knights, sculptors & storytellers ~ Merry Christmas! Okay, this fumbly-bumbly jumble of words, overly-long run-on sentences, and parenthetical asides is actually a test of the new blog feature on my web site. If all goes well it will also be the first official posting (because we might as well all explore this brave new world together). That’s not to say there won’t be some tweaking and editing and alterations before the final, official publication but this will certainly (hopefully) be the gist. And why a blog one might ask? Particularly since not so very long ago i never entertained the notion. Of course not so very long ago (end of last year in fact) i never entertained the notion of a web site either, so i guess this is just the next natural progression step along the process. Basically, even tho i work drawing pictures i am fascinated by the written word. I love to read and i absolutely adore books (which probably explains why i always wanted to be an illustrator) and in my spare time, when i don’t have a book handy, i like to write. While some folks knit or play golf or fashion little animals out of pipe cleaners for relaxation, i enjoy writing. Letters, journal entries, lengthy diatribes about art and philosophy (why the sea is boiling hot and whether pigs have wings – that sort of thing) on the computer or in my trusty 3-ring binder, i love the look and feel of words. Ah, but i digress (which, warning to the casual reader – i do frequently)… i was attempting to explain about the blog. Basically it started out simply to be a little additional feature of the web site where Someone (have i mentioned i have an AMAZING team of web wizards and computer geniuses who do all this work for me because i am a complete dinosaur when it comes to modern technology??) could post up-coming book signing events, new art projects, and related links and articles about said projects & events. Then it was suggested that if i had a blog i could do it myself, with the added benefit of having a little place where i could wax poetically about my work, or art in general, because just about everything i ever draw has a story behind it – which i will tell at the drop of a hat. Either the illustration itself has visual elements that need explaining, or there is an emotional backstory about the project where i came unglued, burst into tears, and drove everyone around me completely insane whining how things weren’t working out. With the blog i can have the best of all possible worlds combining basic News & Events information AND writing! Sharing all that psychological, creative artist-angst, baggage with the world (or at least those poor souls who inadvertently stumble onto the site looking for the other Laurie Klein of which, apparently there are several). So with that explanation (and cautionary warning) aside allow me to publish this puppy and see if i did it correctly. Whether i did, or didn’t, eventually we’ll work the bugs out (my computer friends are the most patient understanding folks in the world – either that or when i call i simply sound like Charlie Brown’s teacher, “Waa, waa,waa,waa” and i’m mistaking their glazed look with sympathetic understanding). So to those unsung heroes – Mark, Cass, Shaun, & Bill, who designed, built, maintain, and otherwise take care of all this (and send me bills) i dedicate this – my very first blog entry, on my still very new web site – to you. Thanks for everything, i truly sincerely could never do it without you! So, as The Doctor [who] would say… Allons-y!